Vesicare is a medicine that reduces the symptoms of an overactive bladder. 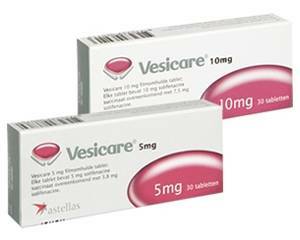 Vesicare tablets are commonly used by people who suffer from incontinence. Vesicare gradually extends the intervals between bathroom visits and increases the amount of urine your bladder can hold. People who are incontinent cannot or are barely able to hold their urine or stool. Incontinence is a very common problem. It is not a disease, but is caused by body functions that are no longer working properly. Vesicare contains solifenacin succinate. Solifenacin works by preventing involuntary spasms of the bladder wall. This reduces the sense of urgency to urinate, which means fewer bathroom visits. It also helps the bladder hold more urine before the urgency to urinate is felt. Other ingredients in solifenacin succinate are corn starch, lactose, hypromellose, magnesium stearate, macrogol, talc, titanium dioxide and iron oxide. Vesicare comes in blister packs containing 30 tablets. Vesicare should be taken orally and swallowed whole with some water. It can be taken with or without food. Do not crush the tablets. The usual dose is 5 mg a day, unless your doctor has prescribed otherwise. Taking Vesicare may cause a dry mouth, blurred vision, nausea and stomach pain. Contact your doctor or pharmacist if these side effects seem excessive. See package leaflet for more information on possible side effects. Note: Vesicare is not suitable for children under the age of 18. Vesicare is also not recommended during pregnancy unless clearly necessary. Do not use Vesicare if you are breastfeeding.